Namaste and Greetings From Nepal!! My name is Dammaru Niraula. 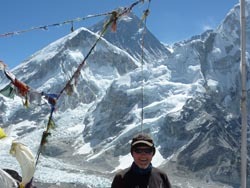 I am from Kathmandu, Nepal, and have been working as a freelance trekking guide in the Himalaya of Nepal for the past 22 years. I am a registered trekking guide with an authorized government office of Nepal and have a license to guide foreigners in the mountain regions of Nepal. 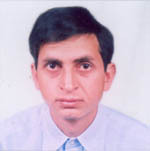 I have been associated with the tourism industry from 1988 and initially began work as a porter in this sector. After working as a porter for 2 years I had an opportunity to work as an assistant cook in the same field. Then after some years of experience in this sector, I began work as an assistant guide. 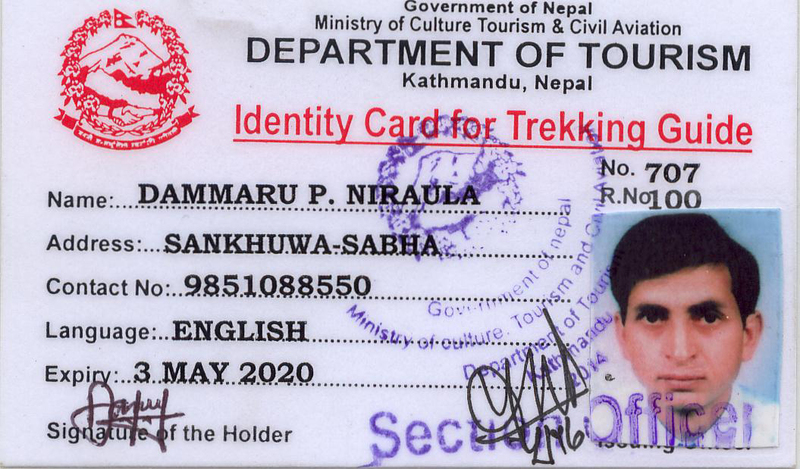 I then completed a two month course in trekking guide training from the authorized body of His Majesty’s Government of Nepal (now Nepali Government), which eventually helped me to become a permanent trekking guide. I also studied to become fluent in English language as well. I have also completed a Japanese language course. Now I am capable of speaking both the English and Japanese language. I have been guiding foreigners professionally as a registered trekking guide since 1990 and I have spent the past 18 years as a specialized trekking guide in the mountains of Nepal. My professional working relationship with trekking agencies follows: I was associated with Himalayan Holidays Trekking Pvt. Ltd, Kathmandu as a full time employee and served in the field of operation for about 10 years. During my ten year with Himalayan Holidays I had an immense opportunity to develop my professional competencies in the field of operations and learnt how to provide high-quality services to the clients to satisfy them thereby making their trip a very memorable one. 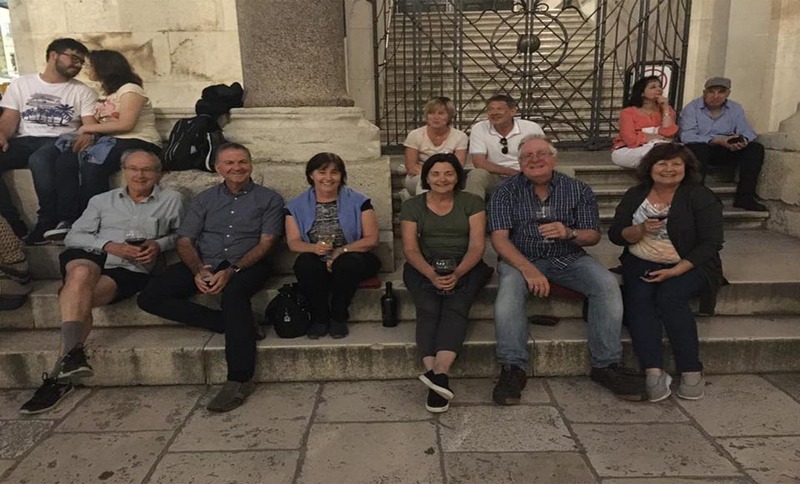 I must admit I am shrewd enough to know that if the clients’ are happy with our services, beyond all doubt, they can give a very positive recommendation about our services to those who intend to visit Nepal. As time passed I worked as a part time employee in this company, and am still employed by them, but I have the flexibility to start my own trekking office within this organization and have been working as a freelance guide. I have led many treks in different regions of Nepal: Everest Region, Langtang Region, Annapurna Region, Lower Mustang Region, etc. Thus, I can confidently state that I am extremely familiar with these regions; I am also acquainted with the general history of Nepal, local flora and fauna, culture and traditions of various ethnic groups of Nepal including environmental issues of the areas popular for trekking. Acute Mountain Sickness (AMS) is always a major concern during high altitude treks. Any negligence may be dangerous to the trekkers suffering from mountain sickness. I am aware with mountain sickness and its symptoms and hence I have been successful in timely rescue of the trekkers suffering from such sickness. Nepal is famous for different kind of adventurous activities. However around 80% of total tourist who visit Nepal come for trekking. Basically two types of activities are organized, namely 1) Tea House Trek 2) Camping/Tented/Organized Trek. In the tea house trek we accommodate in local tea houses including all meals in local lodges. Unlike tea house trek, in the camping trek we accommodate in tents and the foods are cooked and served by the Kitchen team. Before concluding, I would like to reiterate that the vast majority of my clients have been very pleased to have my companionship as their guide. For more information, please feel free to Google my website and check out my testimonials for more details. I am always keen to offer personalized services to all of my valuable clients in very competitive rates. I vouch to exert my best for you, your families, friends, relative’s lifetime memorable trip in my care and guidance. Please do not hesitate to contact me for any information or if you have any queries regarding any kind of treks in the Himalayas of Nepal. Please remember I am always there to assist you in everyway that I possibly can. Once again Namaste and best regards to you all! !